Chennai Super Kings are virtually through to the Indian Premier League play-offs after a comprehensive six-wicket victory over Royal Challengers Bangalore, courtesy a superb bowling effort from the spin duo of Ravindra Jadeja and Harbhajan Singh. 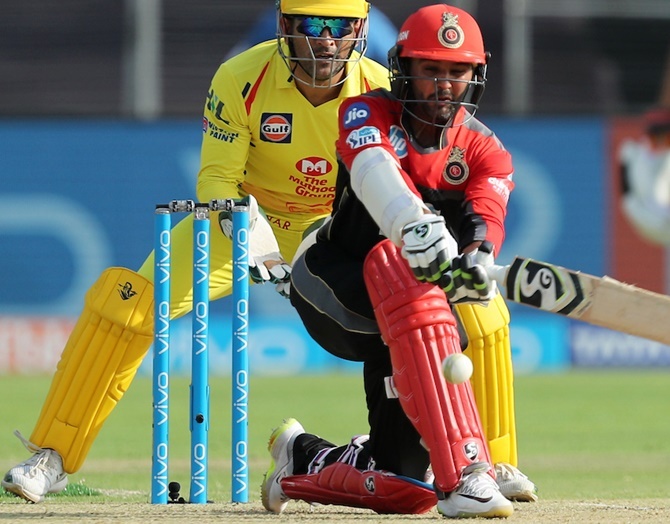 Jadeja (3/18 in 4 overs) and Harbahajan (2/22 in 4 overs) wreaked havoc as RCB could only manage 127 for 9, largely due to efforts from Parthiv Patel (53 off 41 balls) and Tim Southee (36 off 26 balls). 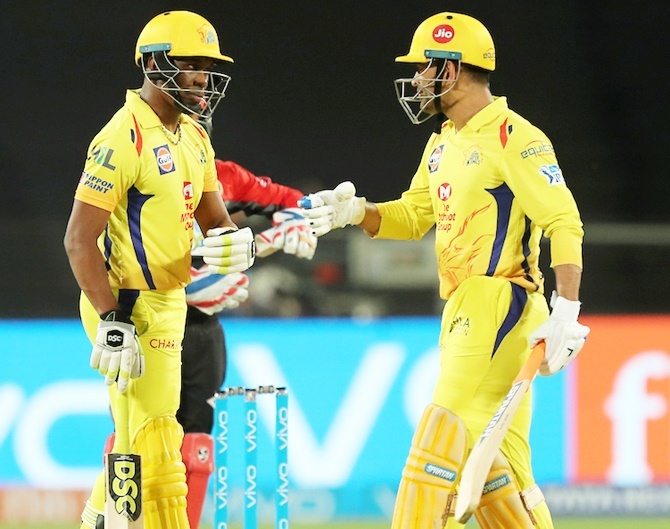 On a tricky pitch, Mahendra Singh Dhoni (31 no off 23 balls) picked up Yuzvendra Chahal for some special treatment with three huge sixes as CSK knocked off the required runs in only 18 overs to move to 14 points from 10 games. Another win in the next four matches will guarantee CSK a spot as 16 points has always been a cut-off for play-off qualification. RCB's sloppy fielding also contributed to their downfall. At 80 for 4 in the 13th over, CSK were in a spot of bother but Parthiv as usual was shoddy behind the stumps, dropping Dwayne Bravo (14 off 17 balls) off Murugan Ashwin. Ashwin was also unlucky when Chahal dropped Bravo at deep extra cover as the all-rounder along with his skipper added 48 runs for the unbroken fifth wicket stand. For Virat Kohli, it is turning out to be yet another disappointing season as RCB once again stare at an imminent exit with only three wins from nine games. Earlier, Jadeja and Harbhajan choked the run flow in the middle overs apart from snaring wickets at regular intervals to peg back RCB. In all, CSK bowled 54 dot balls (equivalent to 9 overs), which also proved to be a key factor. 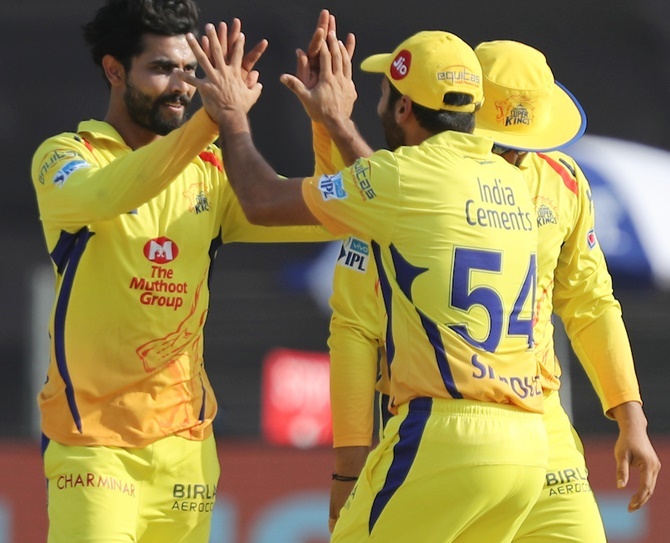 While it was a collective bowling effort by CSK, Jadeja and Harbhajan conceded only 40 runs between them with prize scalps of Kohli and AB de Villiers in their kitty. Jadeja got rid of the Indian captain with an armer which breached Kohli's defence. The ball skidded through the two-paced surface where batting exactly was not easy. In the very next over, de Villiers was stumped trying to reverse-sweep Harbhajan and RCB never recovered from the twin blows. Parthiv did score a half-century but the dismal show of the other batsmen hurt them dearly. Save Parthiv and Southee who ensured a 120-run plus total for the visiting team, none of the other batsmen could even reach double digits. With the ball not coming onto the bat, both Jadeja and Harbhajan also bowled slower through the air to make life more difficult for the batsmen. New ball bowlers Lungi Ngidi (1/24 in 4 overs) and IPL debutant David Willey (1/24 in 4 overs) also used their variations to good effect. Ngidi bowled a lot of slow cutters. Parthiv hit five boundaries and two sixes but he was guilty of not being able to rotate the strike as he time and again failed to read Ngidi's slower ones. He finally gave a return catch to Jadeja as he was not able to check his stroke. Mandeep Singh on the other hand tried to sweep and gave a catch in the deep. Tottering at 89 for 8, it was Southee who took it upon himself, adding 38 runs for the ninth wicket with Mohammed Siraj, whose contribution was a mere three runs.